A recent survey shows nearly 20% of Americans now believe Barack Obama is a Muslim. That’s about 56 million Americans, a number that has climbed considerably since 2008 (to say nothing of the 43% or 120 million Americans who are “unsure”).1 The bigotry of the phenomenon aside, its durability points to the use of rumor bombs (RBs) to elect and govern, and to the role of a new kind of authoritative source therein. 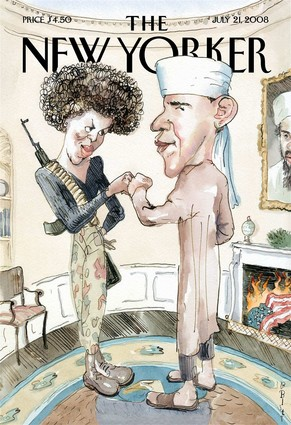 In 2008, FlowTV published my article on the RB, in which I analyzed issue-agendas that convergence culture produced in the 2008 presidential election, including the RB that Obama is a Muslim (RBOIAM). I argued there was an agenda-setting interplay between old and new media technologies, enabled by YouTube, Adobe Photoshop, and Facebook, among others associated with the revolution in cultural production, distribution, and reception—all of which have been associated by some with a new democratizing agency but which I insisted has economic, political rhetorical, and social constraints. 2 Since then, other RBs have exploded in American media culture with greater and lesser damage (e.g. “death panels” RB regarding Obama’s healthcare bill, and the “racist” Shirley Sherrod RB). Now I argue not only that accounts of democratizing cultural production must confront the contingencies of distribution in a context of information warfare (exemplified by RBs); but, further, that Hall’s concept of “primary definers,” significantly criticized in media- and cultural studies of the late 80s and early 90s, returns with a new applicability in convergence culture (CC), with the caveat that primary definers/opinion leaders have changed.3 “Primary definers” refers to elite sources who define hegemonic issues and frames for journalists who repeat and alter them. The media capital they wield complicates theories of democratizing media production and distribution in the forging of widely attended issues in public spheres. The top ten offered another infotainment event, Sarah Palin hosting the late-night comedy show Saturday Night Live (#8 with 56% having heard “a lot”). Rounding out the top 20 were Rev. Wright’s videos and the RB that Obama was close friends with 60s radical-dubbed “terrorist” William Ayers. Other tabloid issues included “McCain and female lobbyist” (#25), Saturday Night Live skits parodying Palin (42%, #34), and the New Yorker cover restating RBOIAM and a terrorist (41%, #36). RBOIAM was the 31st most salient issue/event overall in the campaign, despite far more stories appearing about other events on TV news. This suggests the Internet’s agenda-setting power via YouTube, blogs, conservative sites, forums, and through viral email. To understand how RBOIAM exemplifies an emergent primary definer in a political geometry of distribution/media capital, one must accept the qualification that the distribution/diffusion of democratized cultural production is not at all democratic, but often depends on powerful network nodes. These nodes are similar to Hall’s primary definers. While Campaign 2008 has been celebrated for the diversity of news content and the ability of non-elites to set news agendas and share information, from “Obama Girl” videos to the first YouTube “debates,” the origins of many RBs do not appear to be from novice opinion-makers at all. Andy Martin, Jerome Corsi, Daniel Pipes, and Debbie Schlussel, all key nodes in the network of “Obama is a Muslim” RB circulation, are also all professional conservative newsmakers with popular blogs, books, and mainstream newspaper editorials and cable “news” show appearances.8 These opinion leaders exemplify a new authority via media capital and attention. Technorati ranks blogs’ “authority,” where “authority is calculated based on a site’s linking behavior, categorization and other associated data” over time. Authority is on a scale of 0-1000, where 1000 is “the highest possible authority” (http://technorati.com/what-is-technorati-authority/). Daniel Pipes has a technorati authority of 683 (5/20/2010), while Debbie Schlussel=730. Compare their authority with the Huffington Post, which ranks 959. Liberal news site Daily Kos=780; Wonkette=706; Nobel Prize winner and NY Times columnist Paul Krugman=751; Bill Moyers Journal=488; 3-time Pulitizer Prize for Journalism winner Nicholas Kristof of the NY Times ranked only 527. RBer Andy Martin’s “Contrarian Commentary”=119. Free Republic , where the Muslim RB allegedly first appeared, is a conservative political news clearinghouse, where anyone can post a story. According to the web information company Alexa, Free Republic ranks 1,026 in the U.S. (with 8,397 sites linking to it). Compare that ranking to conservative commentator Michelle Malkin whose site ranks 2,179 in U.S. (www.alexa.com, 5/20/2010). It is very close to “liberal” Talking Points Memo (Joshua Micah Marshall’s site) which has a rank of 1,092. It may be closer to something like liberal Daily Kos’s 1,077 rank with regard to type of posts permitted. However, unlike Free Republic, Daily Kos has a dozen editors who post content (which didn’t stop them from launching the RB that Sarah Palin faked a pregnancy). In a pre-digital media age,10 Pipes, Corsi, Martin, Schlussel, all major conservative information brokers and opinion leaders holding no position in any major political organization or academic institution would not have received the hearing they did get in the contemporary digital age.11 That some of them did not directly appear on traditional news agendas is beside the point (though networks like Fox and CNN frequently feature these opinion leaders, as Lexis-Nexis transcript searches demonstrate). Rather, they broker and source news. In addition to RBOIAM, recent RBs about alleged “death panels” enabled by the new American Healthcare Bill and the RB “Shirley Sherrod is a racist” (resulting in her firing/resignation)15 suggest that this phenomenon applies to understanding not just the political vertigo of campaigns in CC, but also the dynamics of governing in it–to say nothing of watching, processing, even influencing it. Let us engage the geometries of circulation, attention, belief, and confusion. Great article. With all the potential that blog, vlog and social network sites have, for making news stories and reporting more complex, it’s sad (but not surprising) that the mainstream news media have basically used the internet and internet sources as another ideological filter. Thanks, Nestor. People like McChesney and Nichols have recently argued that the phenomenon you describe can only be saved by public funding of “hard” (read old newspaper) journalism, on which TV and Cable news have depended. With their downsizing and infotainment trends, old news becomes the new news you’re describing, sometimes with arguably positive effects, and other times with arguably negative ones. One thing’s sure: this is the future of the war for attention, which is multi-media and self-mass communication (as Manuel Castells has called it), other practices in convergent media culture being often quite differently motivated and more used and commodified than perhaps using and commodifying in terms of larger political and economic struggles. Great article, Jayson. I think this phenomena is also one – if not the major – means by which special interests (I can only recall right-leaning groups, unsurprisingly!) change the debate surrounding issues in the public spotlight. The best, latest examples are the tea baggers who created the RB’s about the death panels and spun healthcare reform as a government takeover, filling the airwaves with this news filler, which disabled true journalism from informing the public. Because some purported media outlets headline RB’s rather than real news, competing media must waste their time responding to these pieces, rather than focusing on what would be helpful to the public, otherwise known as facts, or the truth. Unbelievable how well-written and inrofmative this was.